Hostel beige has clean private single room and double room with private clean toilet & shower room. We offer free wi-fi, computer, and free towel. Every rooms have refrigerator, air conditioning, hair dryer, and TV. Specially You can relax on the our cozy and beautiful terrace in front of the hostel. Our terrace is really beatuful place for taking picture at night. If you decide to stay our hostel in seoul. our staff will always do best to provide friendly travel service and clean rooms for travellers. take airport limousine bus No.6002 at 5B or 12A on the 1st floor. get off at Dongdaemun station. (about: 75min, fare: 10000 won).and at the bus stop, find our sign on the opposit site. 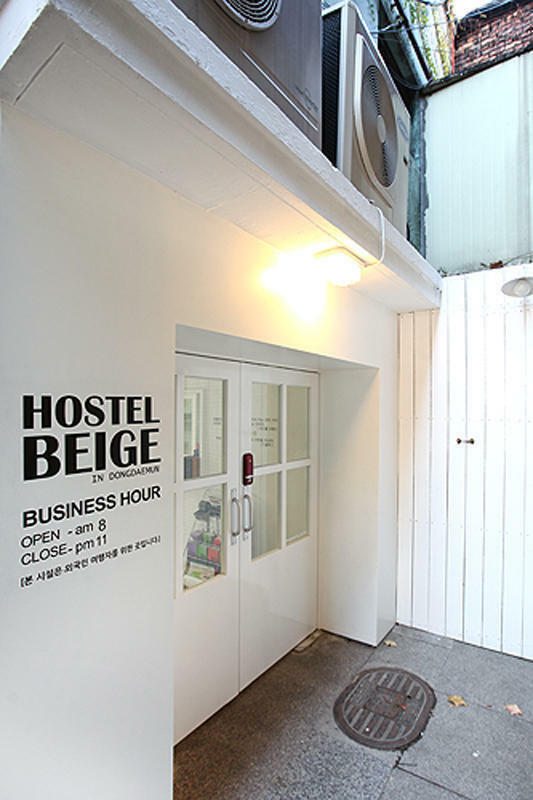 you will see our sign' hostel beige'. and find our sign ' hostel beige'. 1 take the subway line No.5 and get off at dongdaemun history culture park. and transfer to the subway line No.4, get off at dongdaemun station and find Exit no.3 (about: 55min, fare: 1350 won). and then Keep walking straight the street to the end of street(about 50m). and find our sign ' hostel beige'. station, get off at dongdaemun station and find Exit No.3. (about: 45min, fare: 1350 won). Keep walking straight the street to the end of street(about 50m).